← GrrrSnarl (in a most manly tone). Okay, I installed a new hole today. Here’s the new door from the kitchen to the mud/utility rooms. Well, the hole for the door anyway. Got the powersaw (destructor of worlds) out and presto! Little bit of blood, some smoke and dust, and we have a hole! Got a pair of antique French doors going in here. Eight feet tall by 54 inches wide. One thing about doing prep work or teardown to anything in this house…the sheer amount of effort required makes me feel better about owning an old place…they sure put them together solidly! 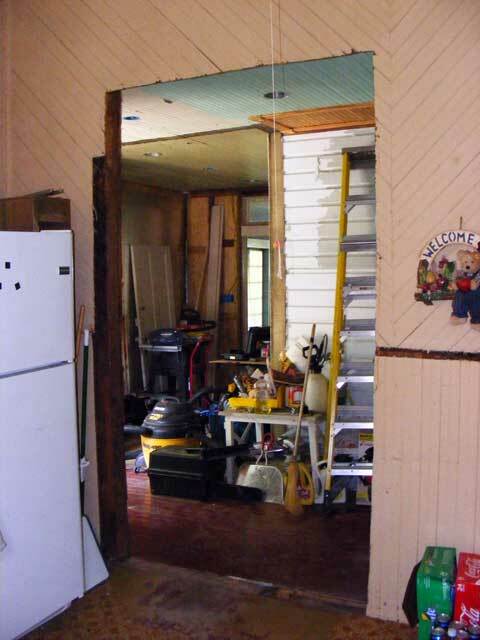 Next week…a hundred bucks with of trim lumber, a couple nails, and a little more blood and I’ll have a door-frame! Oh…and a personal note…I am NOT looking forward to scraping down all that bead-board. One Response to Power tools…holes…they sorta go together.